Haley Gassel learned early life is tough, but she’s proven she is fierce. Her ability to overcome adversity gave her confidence to climb the ranks earning her spot among show jumping’s high performing elite. Horses have been a part of Haley’s life since she was young. Now, she helps around her family’s boarding stable outside Knoxville, TN. When she isn’t training at home, she travels to horse shows to test her skills against other equestrian competitors. 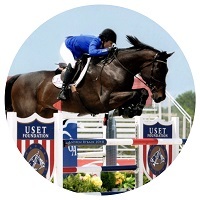 Haley has earned multiple Grand Prix victories including the $50,000 Show Jumping Hall of Fame Grand Prix in 2018. Admittedly, riding isn’t the only thing that keeps this amateur equestrian busy. Haley is also an equine insurance agent, an online health and fitness coach, as well as a bodybuilder turned bikini fitness competitor. Although a balancing act, this go-getter says she wouldn’t trade any of it. Now, she adds columnist to her already impressive list of achievements. Haley joins Horse Authority in order to share how a horse rider’s fitness can improve their saddle time! Get horse rider fitness exercises, tips, and videos available only here at Jumping into Fitness on the first Monday of the month. Don’t miss Haley’s exclusive fitness secrets that benefit all riders, no matter the discipline, even if you hate hitting the gym!